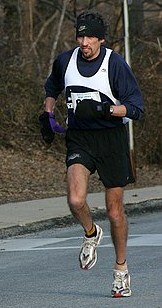 Dave Berardi started running during his sophomore year at Solon High School in the suburbs of Cleveland, Ohio. He was too small for football, and he wanted to stay in shape for tennis. He ended up with three years’ worth of letters in cross country and track, plus a school record 9:42 for two miles. Dave then went on to Bowling Green State University, where as a freshman walk-on, he made the varsity team and was named freshman of the year. After a severe bout of bronchitis effectively finished his freshman year, he concentrated on studies and didn’t run for the school’s teams. He got his degree in four years, while working part time and running “on the side.” In his senior year, he ran a 30:35 in the Cleveland Revco 10K – a faster time than any Bowling Green runner ran on the track! He has run five 10K’s in under 30 minutes, including a 29:14 at the Pittsburgh Great Race. Dave has PRs of 23:56 for 8K, 24:00 for five miles and 49:36 for ten miles. He considers his best distances to be 20K and half marathon, with PRs of 1:02:02 for the New Haven 20K and 1:05:29 for the Philadelphia Distance Classic. He’s completed more than 15 marathons, including a PR of 2:19:58 and a victory in the 1992 Virginia Beach Marathon (2:21:23). Since turning a master, he’s continued to be highly competitive. He recorded PRs of 15:19 for 5K, 32:41 for 10K, 53:23 for ten miles, 1:13:08 for the half marathon and was on the record-setting mixed masters team at the 2001 Hood to Coast in Oregon. Dave’s been a Strider since the early 1990s and has won several of the club’s top awards, while finishing as one of the top finishers for Striders’ teams in numerous races.